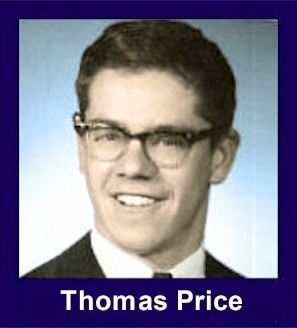 The 35th Infantry Regiment Association salutes our fallen brother, PFC Thomas John Price, who died in the service of his country on September 29th, 1969 in Pleiku Province, Vietnam. The cause of death was listed as Multi-Frag. At the time of his death Thomas was 20 years of age. He was from Stephen, Minnesota. Thomas is honored on the Vietnam Veterans Memorial at Panel 17W, Line 19. The decorations earned by PFC Thomas John Price include: the Combat Infantryman Badge, the Bronze Star, the Purple Heart, the National Defense Service Medal, the Vietnam Service Medal, the Vietnam Campaign Medal and the Vietnam Cross of Gallantry with Palm Unit Citation. Thomas John was my cousin just 1 1/2 month younger than me. A solid farm boy from Minnesota. I am proud of his efforts fighting for a better world. Freedom is worth fighting for and his family and my family now benefit from a better world. Thankyou dear cousin.